Last Friday I took a little trip over to Northpark to find a few key pieces for 4th of July weekend and other easy pieces to tide me over for the rest of summer. J.Crew was obviously my first stop! I picked up this simple pintuck dress that will double as a coverup come Friday, but also looks super cute dressed up for dinner. Since it’s kind of an open, loose fit, I decided to cinch in the waist with an old Forever 21 belt – instead of tying it right in front, I think it’s more fun to push the bow over to the side. It looks less prim and proper that way. As you can see, I’m still wearing my favorite Gorjana necklaces layered like I did in Monday’s post. They really do look good with everything! Another item I picked up at J.Crew is this swiss dot flounce-sleeve number – it’s definitely a dressier option that looks great with pops of red (love Essie Clam Bake nail polish and this lipgloss) and blue (love this Clare Vivier clutch!). Stay tuned to see how I styled the dress next week! Some other pieces I’m eyeing at J.Crew right now include these embroidered shorts (perfect for the beach, no?) and this panama hat. Also, how fun is this bag? Click here to shop all J.Crew’s new arrivals! That little J.Crew dress is so cute, love how you styled it. I’m obsessed with this entire look. that is such a gorgeous dress…It looks so much better on you than it did on the J.Crew site. And I love Gorjana’s delicate gold. Such a pretty summer dress and the navy shade really makes it look more sophisticated…you look gorgeous! Yes, saw that dress so cute love it even more belted! I was just looking at that J.Crew dress the other day online but I wasnt sure how it would look online. But it looks beautiful on you, I am always looking for more simple, easy and beautiful summer dresses! On another note, your clutch is amazing! Wow, I just love it! Beautiful dress. I love Jcrew. But that bag!!! You look good, love the bow to the side idea. Also, those J.Crew shorts are on my watch list. Love. That clutch is such a cool statement. Loving that dress too! Love how you cinched the dress and how equally versatile it’ll be! So chic!!! Love the summery look, and I love your J.Crew picks too!! I would be legitimately frightened to carry that bag though… I can’t lie. I’d feel like a squirrel was sneaking up on me or something. This is perfect for the 4th! That bag is so cool and unique! I love it! That bag. I am in love! It is so funky and fun! I always love a dress that could double as a coverup! Fabulous! 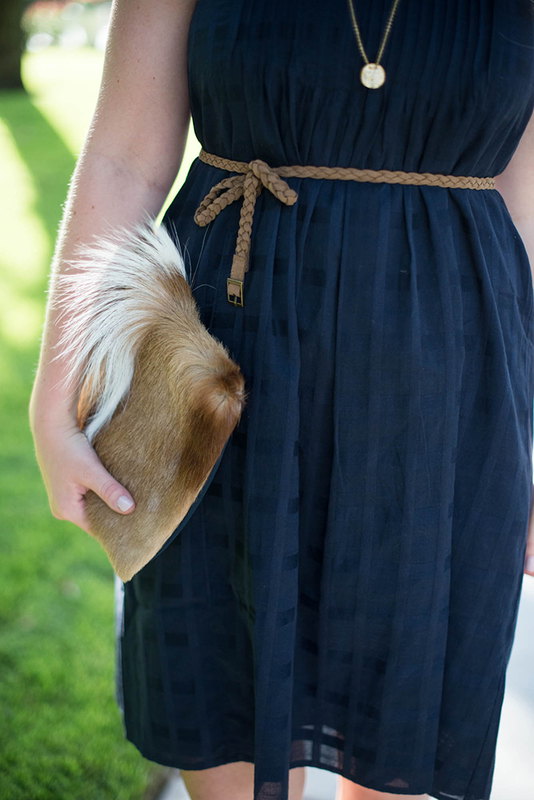 Love that dress, and the clutch is amazing! Beautiful dress. That clutch is very unique and different, I like it a lot. beautiful and simple dress! perfect for the upcoming holiday weekend — happy 4th of july! I love that dress on you! It looks so cute belted. So pretty! would love if you’d stop by my blog at http://www.loveolia.com I think you’d like!! Love the navy on you, and I’ve been eyeing those sunglasses! That PS clutch is so unique!! I’m obsessed!!! You’re looking so beautiful! 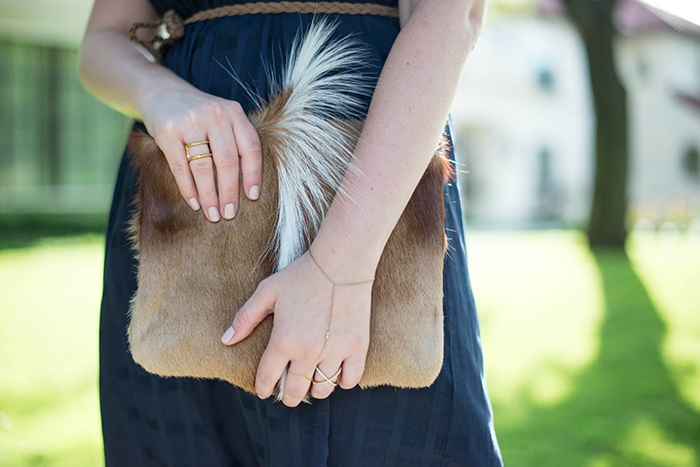 That clutch is a really great statement to the outfit. Love how you belted this dress! Definitely a versatile piece that you will wear again and again. I have always been in love with that clutch! This dress looks perfect for summer! And I love that bag!